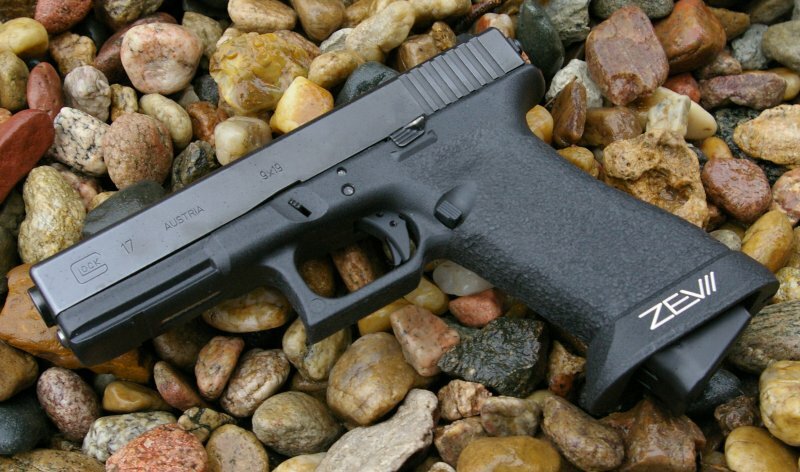 As a shooter and lover of most things Glock, I was intrigued by the transformation process from a stock Glock to a competition Glock in order to make it faster and shoot better. Most people would find it surprising that the Glock is stunningly simple to work on and incredibly simple to upgrade with no-modification drop in parts. 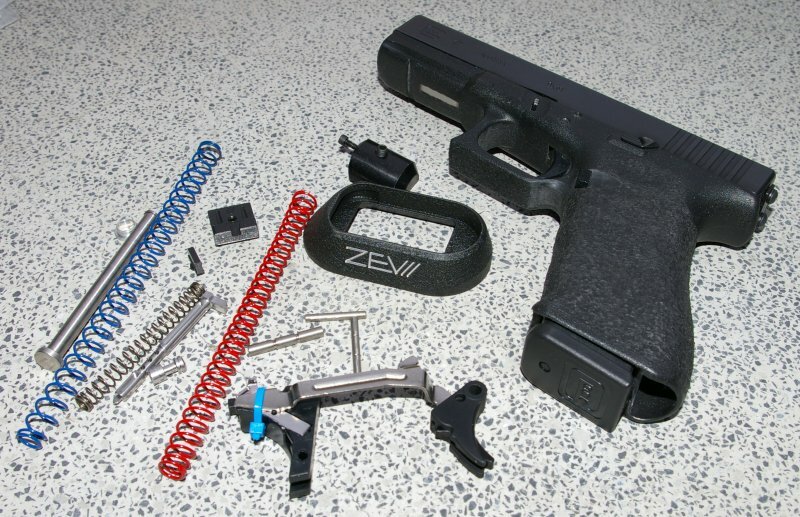 One of the most popular upgrade sites for these upgrades is Glockworx by ZEV Technologies. ZEV Technologies was founded to offer the Glock enthusiast and competitors the best Glock performance parts available. 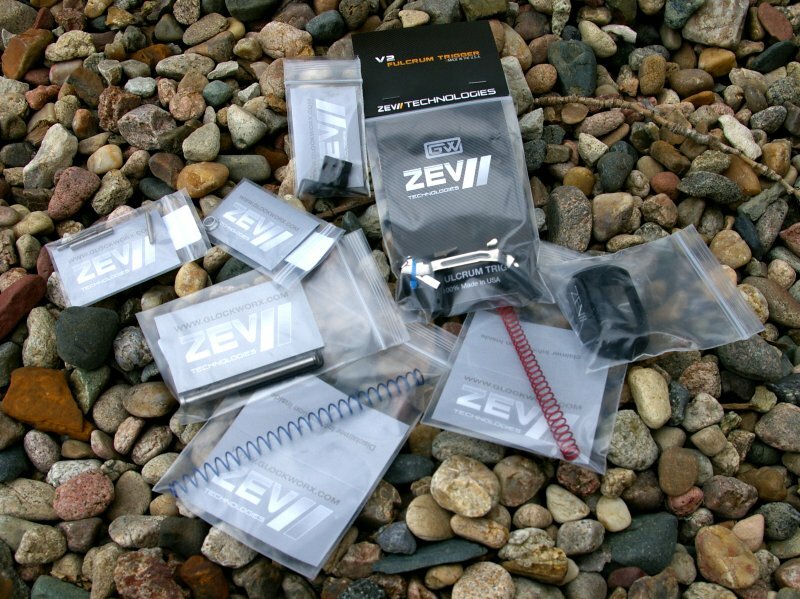 ZEV utilizes modern CNC machining and 3D design to create the top competitive Glock parts available. Take a close look at the top Glock competition shooter's guns and inevitably you will see more than a few ZEV parts on the gun. 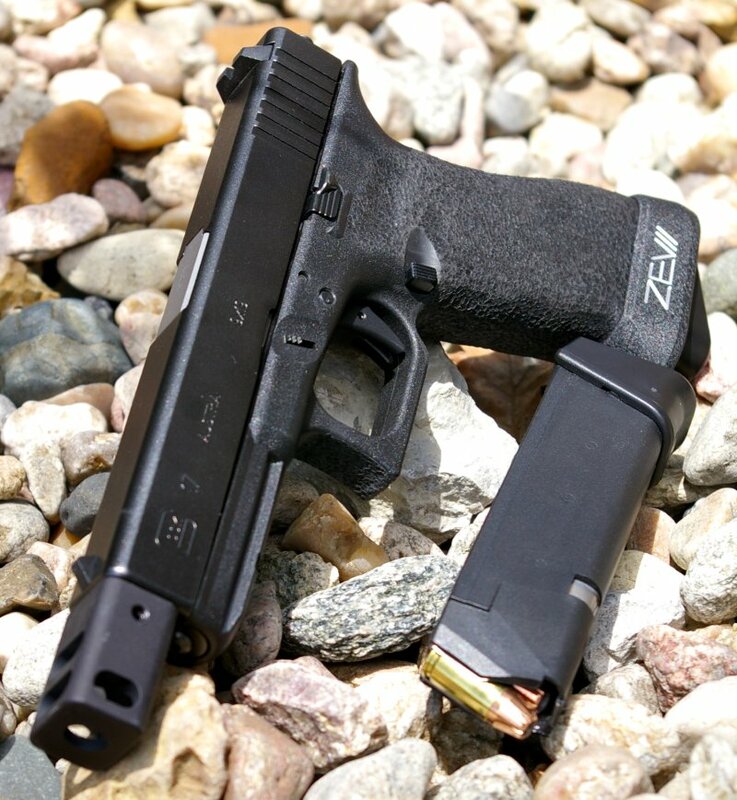 ZEV Technologies also founded Glockworx as a retail site for all the best Glock parts including ZEV’s own parts as well as a huge variety from other manufacturers. 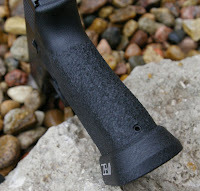 I elected to go all in with about $500 of ZEV upgrades for my Glock 17 Gen 3. 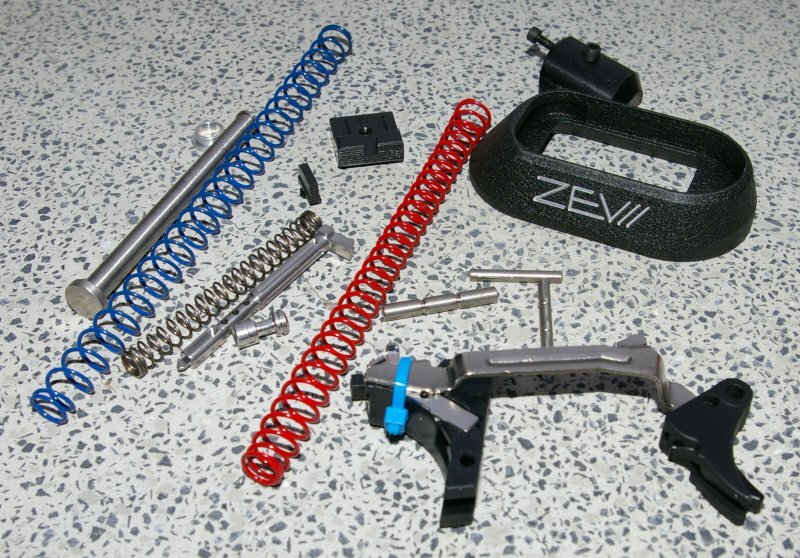 These parts included the ZEV Tech Fulcrum Drop In Kit, Speed Feed Magwell, Stainless Guide Rod, Recoil Spring Retaining Washer, Titanium Frame Pins, Titanium Firing Pin kit, Tech Front and Rear sight kit, and both light and heavy Color Coded Recoil Springs. Later, I added a couple Glock +3 round magazine extensions ($20) and topped off the build with a KKM Match 9mm Glock 17 barrel with Compensator ($275). In the end I took a perfectly good used $450 Glock 17 and replaced nearly everything except the frame and slide for a grand total of around $1245 for the competition ready transformation. One initial transformation I did make was to remove the Gen 3 finger grooves and hand stipple the grip with a wood burning iron with a ball tip. All the ZEV parts arrived nicely packaged and clearly marked, however installation instructions are up to you. 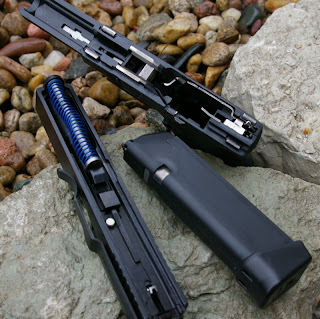 That noted all that is required to work on your Glock is a simple ⅛” punch such as the Ameriglo Glock Tool I used, a small hammer to tap out stubborn pins, and maybe a front sight tool and hex wrench if you are swapping out sights. 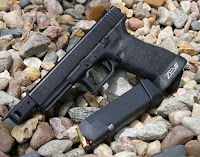 In most cases only a punch and hammer are required to completely break down the Glock. Overall every ZEV part was of high quality, however it should be noted that it would be hard for a non-expert to see a difference between a number of the parts. The difference is that they are lighter and/or stronger or improve the overall trigger feel but do not look much different than the stock parts. The notable exceptions are the stainless guide rod, firing pin, color coded springs and billet trigger shoe and obviously the ZEV magwell is something new. Most of the parts deliver subtle differences such as the ZEV polished titanium Safety which delivers a lighter smoother trigger feel, the titanium frame pins are just a bit oversized to provide a tighter fit on older frames, however other parts are obviously different. The titanium pin is skeletonized, lighter, and polished to improve trigger feel, the Fulcrum Drop in Trigger Assembly transforms the Glock trigger to something truly competition worthy. Of note, I choose the Fulcrum non-adjustable marginally heavier Tactical version instead of the competition fully adjustable model. The main reason for this was that I wanted the ability to swap back to the stock barrel and remove the magwell funnel for use as a carry gun. 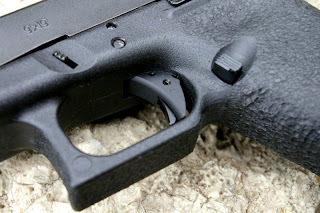 I am an adamant believer that you should never ever have an "adjustable trigger" on a defensive gun; if you want to be in a boatload of legal trouble after defending yourself, have a light match grade adjustable trigger on your gun. Admittedly the ZEV Technologies Fulcrum adjustable trigger is lighter & crisper with a shorter trigger throw for the competitor than the Tactical version. For my needs the Tactical Fulcrum trigger kit was the right choice and still delivers a significantly superior trigger compared to a box stock Glock, but provides an non-adjustable trigger shoe. Because the Glock is so easy to work on, I was able to play around with omitting and swapping out upgrades to see that the ZEV safety did decrease trigger pull and that the addition of the ZEV firing pin did improve the trigger feel beyond just upgrading the trigger unit. The Trigger and barrel delivered the largest noticeable upgrades, however each of the other parts definitely added bit by bit to improve the feel of my used Glock 17 in some way. In the end it was quite a transformation. KKM barrels are used by almost every top Glock competitor because they are significantly more precise and accurate than the stock barrels. 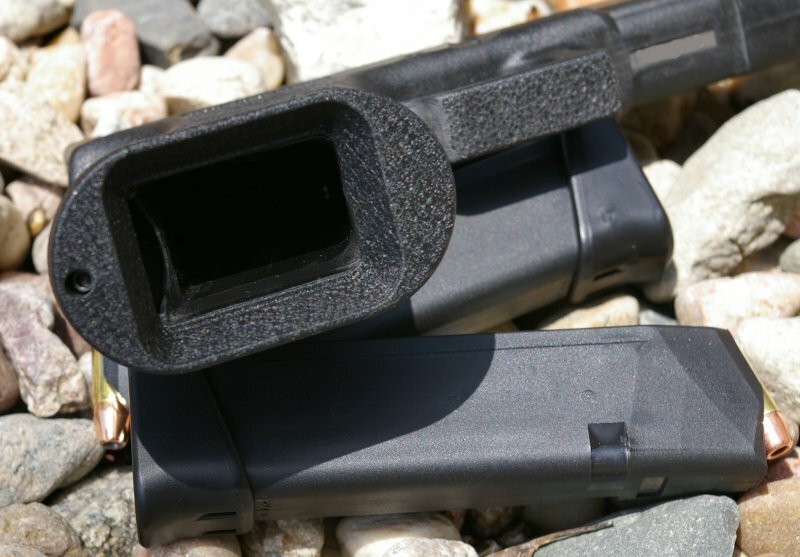 Glock barrels generally have a little "play" in them and the chambers are a bit loose to accommodate imperfections in ammo and improve feeding reliability which are all the specs which keep a Glock working even when dipped in muck. In the sterile confines of a competition, a high toleranced uber accurate barrel is prefered. The KKM barrel I picked up was threaded for the included compensator/brake which delivers a flatter shooting Glock when pushing higher power rounds. 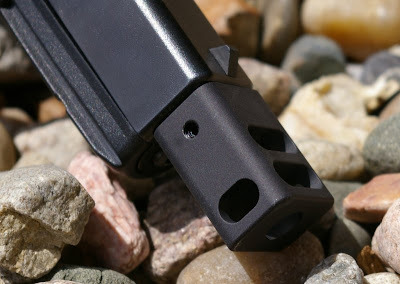 This beautifully machined barrel will have a dedicated review on its own with more specifics. To show just how easy it is to upgrade your own Glock, I created this video to show you how. When in a competition, speed is of the essence and the ZEV Magwell lets you shoot mags in significantly faster and more reliably, however you will need either a magazine bumper extension or at least a 3+ round extension to reliably seat magazines due to the increased depth. Installation was stunningly simple requiring the mounting of a grip plug and then screwing on the magwell. This installation also allows the magwell to be easily and quickly removed via just own screw should you decide to carry the pistol outside of competition. 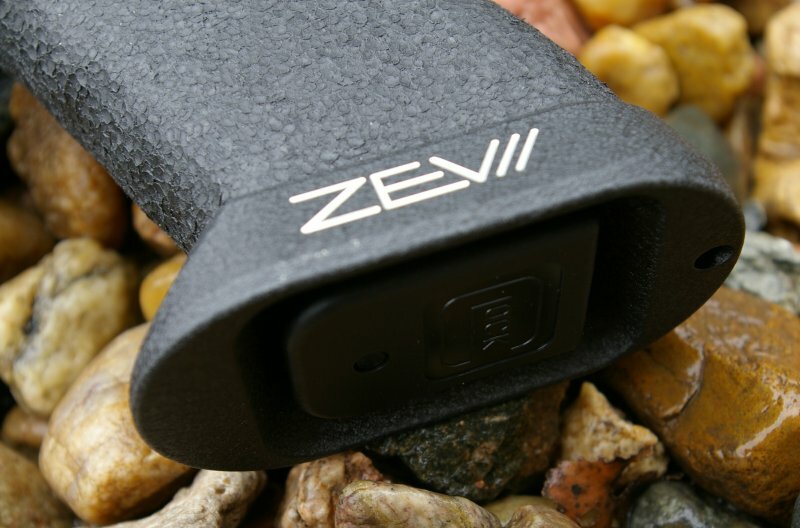 As noted above, the ZEV Fulcrum trigger delivers the most noticeable functional difference with a decreased pre-travel and overtravel and significantly crisper trigger feel. I have shot the adjustable version and it delivers a zero pre-travel and perfect overtravel out of the box, but also provides the ability to fiddle with the tuning yourself. The stock Glock’s trigger safety is not spring loaded, but the ZEV model is. On one side it improves the engagement of the safety, however I found it just a bit too strong and ended up chopping 25% of the trigger safety spring off to reduce the tension, however this is obviously not recommended by anyone. Along with being lighter and offering potentially faster lock times and a smoother trigger feel, the Titanium Firing Pin has an extended firing pin face for improved detonation. I occasionally use Small Rifle Primers in my reloads which are harder, however I had no issues with reliable detonation with this firing pin. The firing pin kit also includes the above mentioned titanium firing pin safety and a new spring for the firing pin; all of which improve the trigger feel. Many people swear by stainless recoil springs for the Glocks however generally I see people having problems with them. 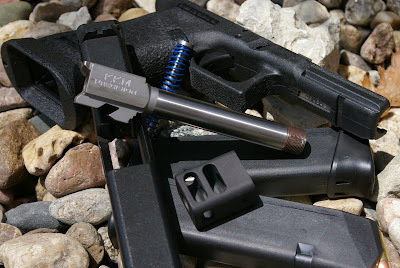 The stock Gen 2-3 Glock springs are mid-light weighted and perform well with a wide variety of loads, however I see many people moving to heavier springs to reduce recoil. 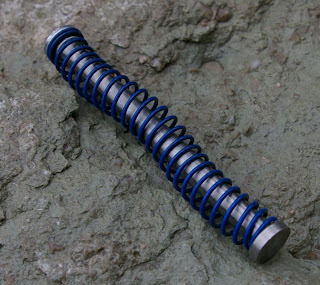 This is not an issue if you reduce the slide weight or run hotter loads, however generally problems occur with a heavy spring paired with a stock slide and mid-light loads. The reality is for a competition gun with a muzzle brake/compensator, you need a fairly hot load to feed enough muzzle blast to make the muzzle brake effective. I shot the ZEV G17 with the KKM Compensator side by side with a stock Glock 17 and I would have better luck flipping a coin to decide the difference with light handloads. I also had some reliability issue with the heavier spring with light loads; swapping over to the light spring solved that issue. Once I slipped in the snappier 9mm loads, the heavy spring went back on and the compensator had enough exhaust to work with and provided a significantly flatter shooting gun. Also the Hexagonal rifling on the Glocks appears to be more forgiving on less premium reloads, however the KKM barrel provided significantly better accuracy than stock with Hornady XTP bullets zipping down the barrel. 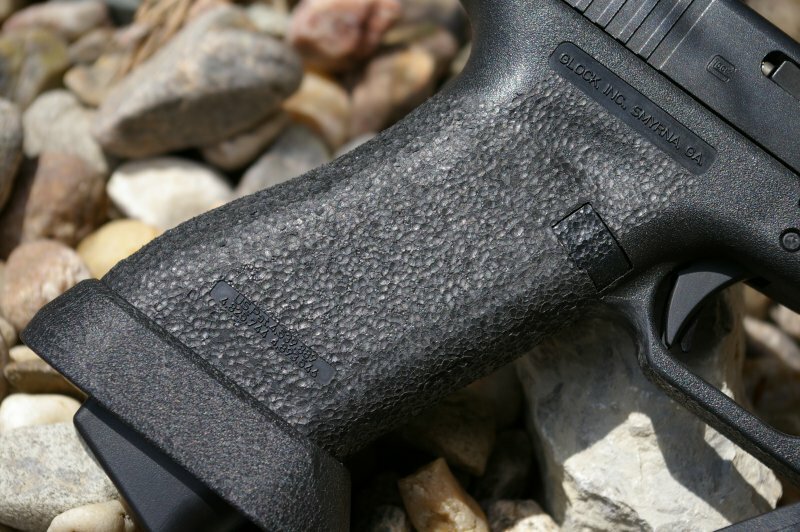 One would think that it should take far longer than 30 minutes to slip around $800 worth of upgrades into a Glock,but it actually could take far less if you have done it a few times. After my first assembly before the video, I was shocked how long it didn't take me to slip in all the parts. 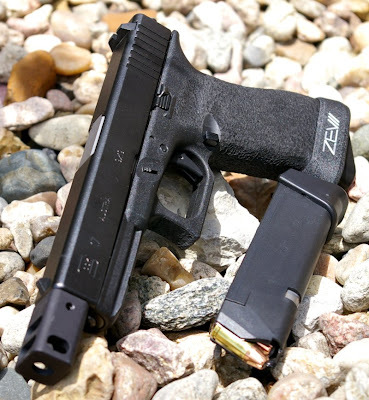 This is a simple and easy upgrade to your stock Glock that can deliver a huge improvement in trigger feel, accuracy and an overall faster shooting Glock. To increase accuracy in hunting, you select for scope a good range.